Police are seeking three men who allegedly lured another man to an apartment Sunday morning in San Francisco's Tenderloin neighborhood and robbed him while threatening him with a machete. Around 5:30 a.m., officers responded to a report of a robbery at knifepoint near the corner of Leavenworth and Ellis streets, according to police. Police then learned the victim, a 60-year-old man, had been approached by one of the suspects, who asked him to join him in his room. Once inside the room, two other men arrived and pulled out a machete, demanding that the victim hand over his property, police said. The suspects took the victim's wallet, which had cash, his debit card and his ID, according to police. One of the suspects then kicked the victim in his hip. The victim suffered had some pain to his hip, but refused medical treatment. The three suspects were described as men between the ages of 40 and 60, according to police. 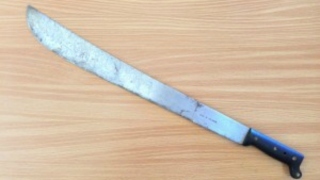 The incident marks the third incident involving a machete in San Francisco this month. On Wednesday, a 22-year-old man was struck on the neck with a machete after a fight in the city's Oceanview neighborhood. He suffered non-life threatening injuries. A suspect was arrested in that attack. That same evening, an argument in the city's Visitaction Valley neighborhood resulted in a 49-year-old man suffering life-threatening injuries after being stabbed with a machete.